Review: Tired of squealing, cutesy seiyuu pop ruining your favorite anime series week after week? Exasperated by a bunch of whiny-sounding prettyboys singing about “Maji love 1000%” or some similar sort of nonsense? Are you just looking for something… anything that sounds manly for a change? “Grizzly-san no G★ROCK” is just what the doctor ordered. “Grizzly-san no G★ROCK’s” gruff introduction of “G-R-I-Z-Z-L-Y!” makes it abundantly clear that this isn’t going to be your run-of-the-mill ending theme. It’s brash, it’s emphatic, and once Yuichi Nakamura hits his stride and goes into the song with gusto, it grabs you with its energy and never really lets go. Nakamura’s performance is appealing in its earnestness; he plays his role as Grizzly to the hilt, and then some, keeping us rapt in attention through his bassy baritone, and then, going over the top by dispensing with the occasional bellow to spice things up. Couple that performance with a rock rhythm vaguely reminiscent of classic numbers like Elvis Presley’s “Hound Dog” and some excellent keyboard work during the bridge, and you get a catchy song that’s tough to turn away from. 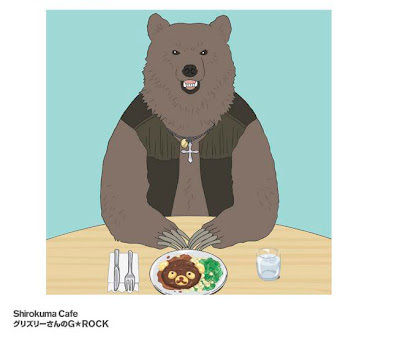 The B-side, “Shirokuma Cafe ~Grizzly~” is only slightly less enjoyable. Its introduction features big, brassy phrases to back up Nakamura’s gruff opening narration, but his singing, while jumpy and playful, is less exaggerated for the most part, which unfortunately makes it less memorable. That’s not to say the song doesn’t have its moments. The chorus segment containing lyrics that sing of apple pie, followed shortly thereafter by what sounds like “Nom! Nom! Nom!” (probably in actuality, “No! No! No!”) from the backup singers left me with a big grin. On the instrumental front, the touches of ska-like sounds and a meandering keyboard during the bridge add to the song’s whimsical flavor and works well with Nakamura’s relatively laid-back delivery. Finally, the narration towards the end flows elicited a laugh as it goes from waveringly melodramatic to brusquely stern. So although “Shirokuma Cafe ~Grizzly~” doesn’t try to be anything special, its snappiness does yield a decently short-lived romp as it injects an ephemeral bit of energy and hilarity. Earlier this year, I had written a review of Kill Me Baby’s opening theme, where I acknowledged that it was probably a joke, and a bad one at that because of how deliberate it went about trying to be awful. “Grizzly-san no G★ROCK” takes the high road by retaining the over-the-top feel but having Yuichi Nakamura deliver it in a way that is earnest and, instead of being gimmicky, will have listeners roaring with delight. That is the most awesome cover I’ve seen in a long long time!!! I agree! Just looking at that gives you an idea of what you’re in for! Oh man, the first para made my day! That was really funny. I don’t watch this anime but the song’s good. It’s definitely very entertaining. I don’t watch the anime either, but really enjoyed the way this song departs from the usual anisong. I’ll have to give Eureka Seven Ao a listen (I seem to be playing catchup lately). No guarantees for a review, but if nothing else, I’ll have some impressions to give if this lands on the year-end retrospective.